Equal Exchange has released a new paper outlining how member-owned capital can provide an effective savings tool and financial safety net for smallholder farmers. 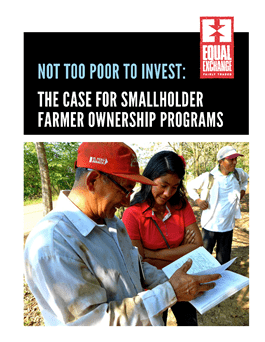 The findings in “Not Too Poor to Invest: The Case for Smallholder Farmer Ownership Programs”grew from an Equal Exchange project to introduce member equity programs in smallholder farmer businesses in three countries: Dominican Republic, Ecuador and Peru. Experience has shown creation and growth of a member-owned capital base is crucial to the long-term sustainability of member-owned businesses and can provide an effective savings tool and financial safety net for smallholder farmers. In addition to discussing the role of and necessity for member investment in a strong capital base in group-owned businesses, the paper also identifies potential sources of capital, the difference between equity and debt capital and the importance of member contributions to capital in smallholder enterprises. Equal Exchange, a pioneer and U.S. market leader in Fair Trade since 1986, is a $60 million importer and wholesaler of high quality, organic coffee, tea, olive oil, bananas and other foods to customers across the United States. 100% of Equal Exchange products are fairly traded, benefiting more than 50 small farmer co-operatives in 40 countries around the world. Equal Exchange is a worker co-operative, owned and democratically controlled by its employees.